Leah Hogsten | The Salt Lake Tribune The house at 584 E. East Canyon Road in Payson where Duane Rhedd Youd, 47, crashed a plane about 2:30 a.m., Monday, August 13, 2018. Firefighters arrived to find the home engulfed in flames. The two people inside the home escaped through the back of the home and were uninjured. Youd had been booked into the Utah County Jail about 7:30 p.m. Sunday after being suspected of assaulting his wife. He bailed out of jail; returned to the home with a police officer about midnight to retrieve belongings and his truck; and left without incident. Leah Hogsten | The Salt Lake Tribune None us us saw this coming, said Joslyn Youd, 21, with her brother Parker Youd, 17, talking about her father Duane Rhedd Youd near the house at 584 E. East Canyon Road in Payson where Youd, 47, crashed a plane about 2:30 a.m., Monday, August 13, 2018. Youd died in the plane crash. Firefighters arrived to find the home engulfed in flames. The two people inside the home escaped through the back of the home and were uninjured. Youd had been booked into the Utah County Jail about 7:30 p.m. Sunday after being suspected of assaulting his wife. He bailed out of jail; returned to the home with a police officer about midnight to retrieve belongings and his truck; and left without incident. Leah Hogsten | The Salt Lake Tribune The house at 584 E. East Canyon Road in Payson where Duane Rhedd Youd, 47, crashed a plane about 2:30 a.m., Monday, August 13, 2018. Firefighters arrived to find the home engulfed in flames. The two people inside the home escaped through the back of the home and were uninjured. Youd had been booked into the Utah County Jail about 7:30 p.m. Sunday after being suspected of assaulting his wife. He bailed out of jail; returned to the home with a police officer about midnight to retrieve belongings and his truck; and left without incident. Leah Hogsten | The Salt Lake Tribune Parker Youd, 17, talks with a Payson Police Department investigator. Youd's father Duane Rhedd Youd crashed a plane he was piloting about 2:30 a.m., Monday, August 13, 2018 into a house at 584 E. East Canyon Road in Payson. Youd died in the plane crash. Firefighters arrived to find the home engulfed in flames. The two people inside the home escaped through the back of the home and were uninjured. Youd had been booked into the Utah County Jail about 7:30 p.m. Sunday after being suspected of assaulting his wife. He bailed out of jail; returned to the home with a police officer about midnight to retrieve belongings and his truck; and left without incident. 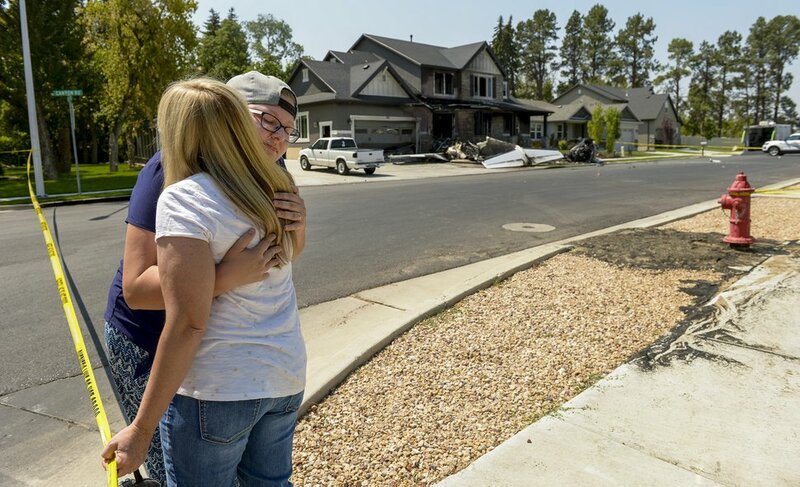 Leah Hogsten | The Salt Lake Tribune Joslyn Youd, 21, gets a hug from her Aunt Nikki Ewell outside the house at 584 E. East Canyon Road in Payson where Joslyn's father, Duane Rhedd Youd, 47, crashed a plane about 2:30 a.m., Monday, August 13, 2018. Youd died in the plane crash. Firefighters arrived to find the home engulfed in flames. The two people inside the home escaped through the back of the home and were uninjured. Youd had been booked into the Utah County Jail about 7:30 p.m. Sunday after being suspected of assaulting his wife. He bailed out of jail; returned to the home with a police officer about midnight to retrieve belongings and his truck; and left without incident. (Photo courtesy of FOX 13) A small plane crashed into a house in Payson early Monday, killing the pilot — but the two occupants of the home escaped without injury despite an explosion and fire that engulfed the structure. Leah Hogsten | The Salt Lake Tribune The house at 584 E. East Canyon Road in Payson where Duane Rhedd Youd, 47, crashed a plane about 2:30 a.m., Monday, August 13, 2018. Firefighters arrived to find the home engulfed in flames. The two people inside the home escaped through the back of the home and were uninjured. Youd had been booked into the Utah County Jail about 7:30 p.m. Sunday after being suspected of assaulting his wife. He bailed out of jail; returned to the home with a police officer about midnight to retrieve belongings and his truck; and left without incident. 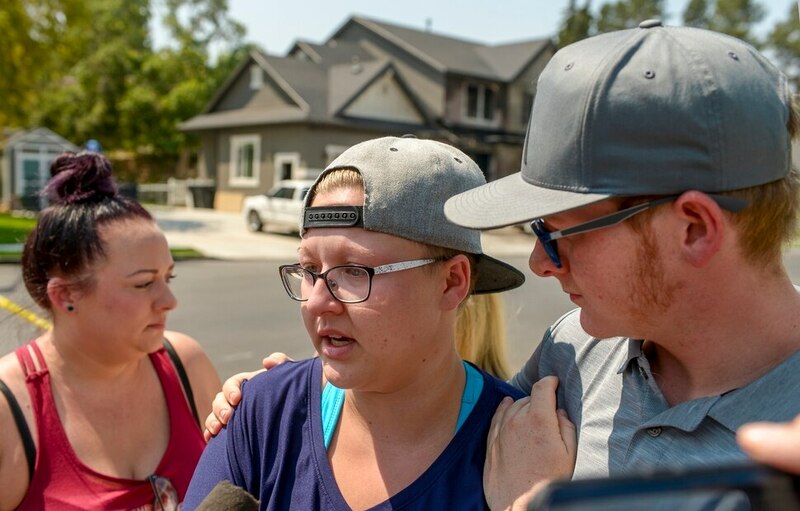 Leah Hogsten | The Salt Lake Tribune None us us saw this coming, said Joslyn Youd, 21, with her brother Parker Youd, 17, talking about her father Duane Rhedd Youd near the house at 584 E. East Canyon Road in Payson where Youd, 47, crashed a plane about 2:30 a.m., Monday, August 13, 2018. Youd died in the plane crash. Firefighters arrived to find the home engulfed in flames. The two people inside the home escaped through the back of the home and were uninjured. Youd had been booked into the Utah County Jail about 7:30 p.m. Sunday after being suspected of assaulting his wife. He bailed out of jail; returned to the home with a police officer about midnight to retrieve belongings and his truck; and left without incident. The Youd's half sister Janna Hanson is at left. Leah Hogsten | The Salt Lake Tribune The house at 584 E. East Canyon Road in Payson where Duane Rhedd Youd, 47, crashed a plane about 2:30 a.m., Monday, August 13, 2018. Firefighters arrived to find the home engulfed in flames. The two people inside the home escaped through the back of the home and were uninjured. Youd had been booked into the Utah County Jail about 7:30 p.m. Sunday after being suspected of assaulting his wife. He bailed out of jail; returned to the home with a police officer about midnight to retrieve belongings and his truck; and left without incident. Leah Hogsten | The Salt Lake Tribune Joslyn Youd, 21, talks about her father Duane Rhedd Youd near the house at 584 E. East Canyon Road in Payson where Youd, 47, crashed a plane about 2:30 a.m., Monday, August 13, 2018. Youd died in the plane crash. Firefighters arrived to find the home engulfed in flames. The two people inside the home escaped through the back of the home and were uninjured. Youd had been booked into the Utah County Jail about 7:30 p.m. Sunday after being suspected of assaulting his wife. He bailed out of jail; returned to the home with a police officer about midnight to retrieve belongings and his truck; and left without incident. (Photo courtesy of FOX 13) A small plane crashed into a house in Payson early Monday, killing the pilot — but the two occupants of the home escaped without injury despite an explosion and fire that engulfed the structure. Payson • A small jet crashed into a house in Payson early Monday, killing the pilot — who police say lived in the home with his wife. Duane Youd, 47, had been booked into the Utah County jail at about 7:30 p.m. Sunday after being suspected of assaulting his wife, Payson Police Sgt. Noemi Sandoval told the news media, including a FOX 13 reporter. He bailed out of jail, returned to the home with a police officer at about midnight to retrieve belongings and his truck, and left without incident. “He is an experienced pilot. He flew from Spanish Fork airport directly here, into the home,” Sandoval said, adding that it could have been “much worse." The small jet flew under power lines and clipped a shed and “that maybe changed his trajectory a little bit," Sandoval said. The plane hit the house at 584 E. East Canyon Road about 2:30 a.m. and exploded. Firefighters arrived to find the home engulfed in flames. Youd’s wife and her son, who were Inside the house escaped through the back of the home and were uninjured. The aftermath looked like a Hollywood backlot during the filming of a blockbuster. 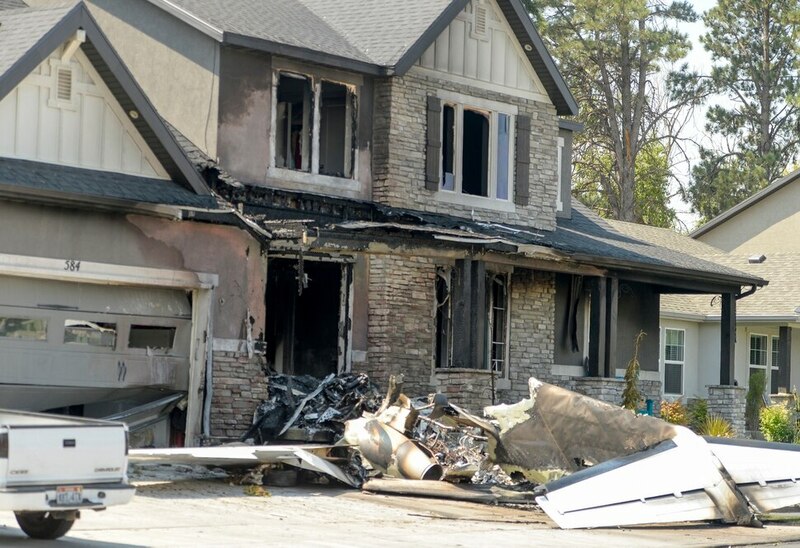 The charred remnants of the Cessna Citation Jet 525 sat in front of the home. An overturned car was beside it; what remained of the plane rested by the front door. The plane hit the car before slamming into the house. Canyon Road remained closed Monday morning from approximately 400 East to 600 East and from 1260 South to the mouth of Payson Canyon as police investigated. Leah Hogsten | The Salt Lake Tribune The house at 584 E. East Canyon Road in Payson where Duane "Rhedd" Youd, 47, crashed a plane about 2:30 a.m., Monday, August 13, 2018. Firefighters arrived to find the home engulfed in flames. The two people inside the home escaped through the back of the home and were uninjured. Youd had been booked into the Utah County Jail about 7:30 p.m. Sunday after being suspected of assaulting his wife. He bailed out of jail; returned to the home with a police officer about midnight to retrieve belongings and his truck; and left without incident. “I said, ‘I love you. Good luck. I’ll see you tomorrow,’” the son said. “He said, ‘I love you, too,’ got in his truck and drove away." Utah County Sheriff’s Sgt. Spencer Cannon said deputies on Sunday evening received a report of a man assaulting a woman in American Fork Canyon. When deputies arrived, they encountered Youd. Cannon said the woman turned out to be Youd’s wife. Witnesses told deputies the assault occurred in an area of the canyon known as Cascade Springs and continued to the summit trailhead. Cannon said Youd’s wife suffered some injury, but he didn’t know the extent. Cannon said Youd used a bondsman to post $1,940 bail — an amount set by state courts for domestic violence suspects. Before he was released from jail, Youd also would have been required, Cannon said, to sign an agreement not to contact his wife. Youd had lived in the house for about two years, said his former next-door neighbor, Zach Linch, who was stunned to see the aftermath. Leah Hogsten | The Salt Lake Tribune Joslyn Youd, 21, gets a hug from her Aunt Nikki Ewell outside the house at 584 E. East Canyon Road in Payson where Joslyn's father, Duane "Rhedd" Youd, 47, crashed a plane about 2:30 a.m., Monday, August 13, 2018. Youd died in the plane crash. Firefighters arrived to find the home engulfed in flames. The two people inside the home escaped through the back of the home and were uninjured. Youd had been booked into the Utah County Jail about 7:30 p.m. Sunday after being suspected of assaulting his wife. He bailed out of jail; returned to the home with a police officer about midnight to retrieve belongings and his truck; and left without incident. Linch said he never saw any indication Youd was violent. “I didn’t hear the explosion,” Taylor added, “but I heard all the sirens. It woke me up from a dead sleep. Citation 525s have two jet engines. They can carry up to two crew members and eight passengers. Herbert, who had been friends with Duane Youd since the two were teenagers, said this didn’t seem like something his friend would do. “It was a complete shock when I turned on the TV and saw his picture,” Herbert said. He saw Youd and his wife a few months ago, and they seemed fine. Youd “was happy and had lots of energy just like he always did,” Herbert said.